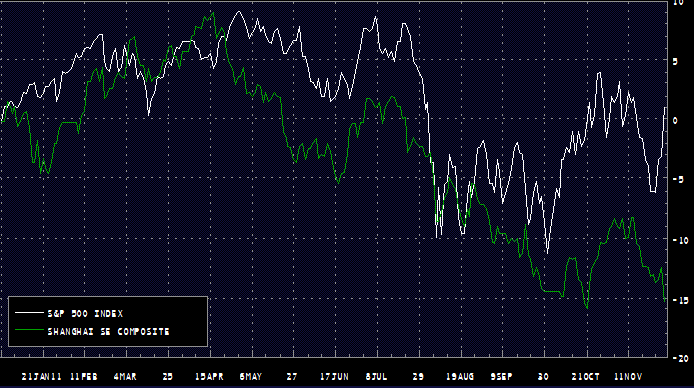 As China comes to grips with a significant slowdown, the Chinese equity markets are underperforming. 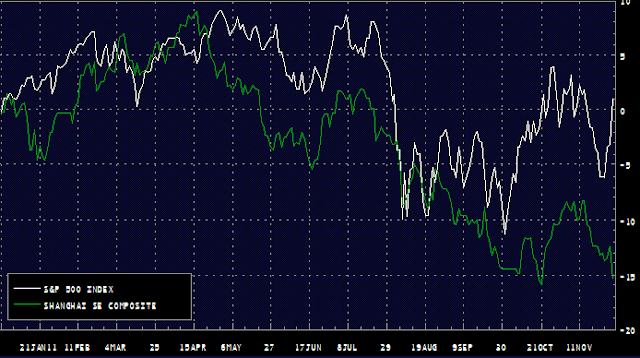 In fact year to date with dividends included, the Shanghai Composite has underperformed the S&P500 by over 16%. To address this China's central bank has lowered the reserve requirement ratio yesterday by 50bp, effectively injecting liquidity into the banking system. Xinhua: The latest cut, effective on Dec. 5, drops the RRR to 21 percent for large commercial banks and 17.5 percent for mid- and small-sized banks. An estimated 396 billion yuan (62.38 billion U.S. dollars) in capital will be released into the market. It's a dangerous move given the inflationary pressures the nation is still facing (at 5.5%, down from 6.1%). They must believe that the risks to the downside, given the euro-zone crisis, outweigh the risks of inflation accelerating again. Another stimulus action from the central bank seems to be more subtle. 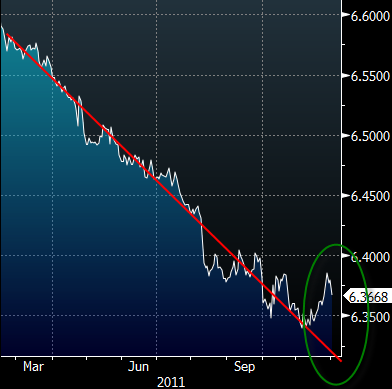 They markedly slowed down the renminbi appreciation in order to provide stimulus to the exporters. It's not clear how much effect this may have on China's economy, but it will definitely get the US politicians back on the "currency manipulation" bandwagon, particularly during the election year.